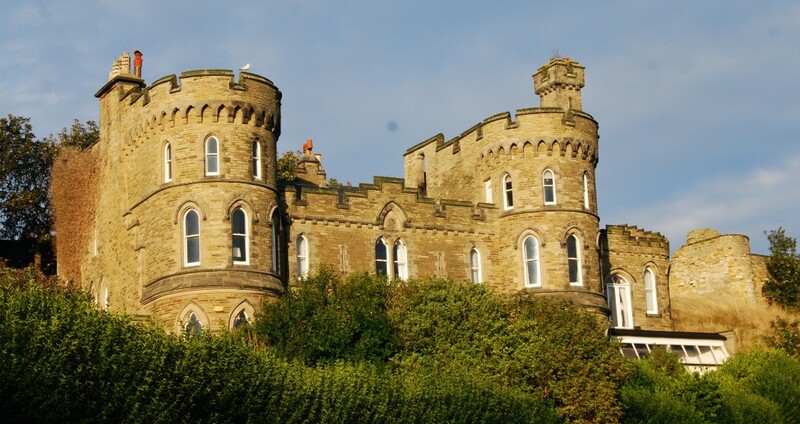 Scarborough has three castles – the genuine article which dates back to Roman times, and two Victorian shams which have their own unique appeal. The Scarborough brewer Thomas Jarvis built The Towers, designed by William Baldwin Stewart in 1866, immediately below the gatehouse of the medieval castle on the promontory that divides Scarborough’s two bays. He later added the Castle-by-the-Sea, which overlooks the North Bay, at the other end of the little street that became Mulgrave Place, and in 1876 leased it to the Leeds artist, Atkinson Grimshaw (1836-1893). Atkinson Grimshaw was the son of a Leeds policeman, an ex-railway-clerk who without formal training executed canvases of dusk and moonlight scenes, mainly of coast and harbour settings, with considerable commercial success. One of his first and finest Scarborough works is ‘Sic Transit Gloria Mundi, the Burning of the Spa Saloon’ (1876), which was probably commissioned by Jarvis and was painted in great haste for the sake of topicality but not publicly exhibited. It is now in the Scarborough Art Gallery [http://www.scarboroughartgallery.co.uk], along with ‘Scarborough Lights’ (c1877), ‘Burning off a Fishing Boat at Scarborough’ ) and ‘Lights in the Harbour, Scarborough’ (1879). Atkinson Grimshaw reputedly influenced Bram Stoker into setting Dracula in Whitby. He’s also regarded as a possible influence on Frank Meadow Sutcliffe, the Whitby photographer. He returned to Leeds in 1879 after getting into financial difficulties, and went on to paint numerous scenes in Hull, Liverpool, London and Glasgow Docks. 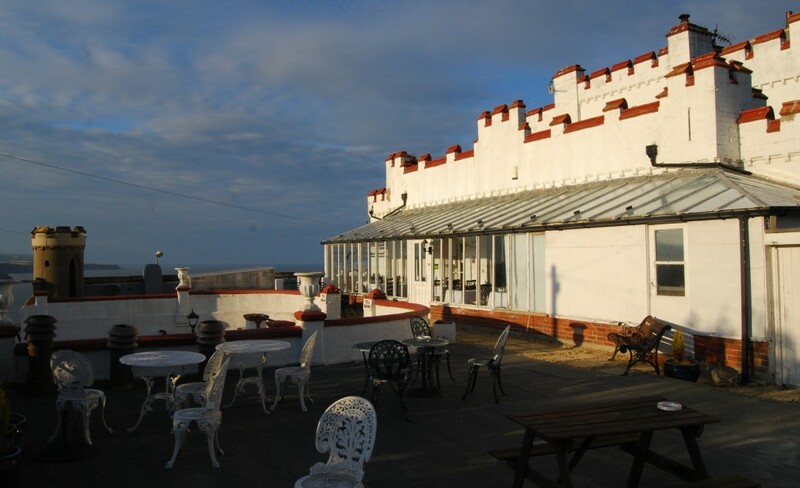 The Castle-by-the-Sea is a notably welcoming bed-and-breakfast hotel, one of the pleasantest places to stay in Scarborough: http://www.thecastlebythesea.co.uk. The Towers is a private residence and not open to the public. This entry was posted in Life-enhancing experiences, Survivals & Revivals: past views of English architecture, Victorian Architecture, Yorkshire's Seaside Heritage on February 25, 2014 by Mike Higginbottom. An unexpected sight on the rail journey between Norwich, Cromer and Sheringham is the busy little station of the Bure Valley Railway at Wroxham. It’s literally little because the Bure Valley trains run to the tiny gauge of fifteen inches. The line follows the trackbed of the former East Norfolk Railway standard-gauge line to Aylsham, which is now the terminus. Originally it extended past what is now a Tesco car-park to a junction at County School. 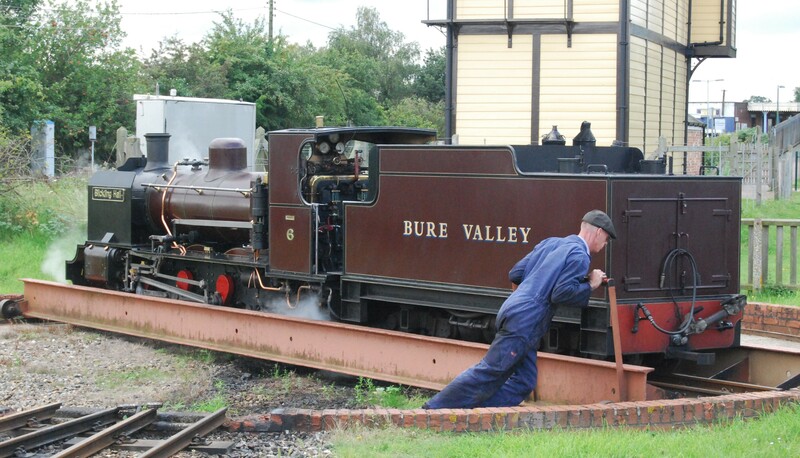 The scale of the Bure Valley trains allows for the full paraphernalia of main-line steam and diesel operation. The Aylsham station has four platforms and a complicated track layout, and both termini have turntables: indeed, the turning of the locomotive at Wroxham is a highlight of the journey. Miniature it may be, but this is no toy railway. Indeed, it operates boat trains which offer a return journey from Aylsham to Wroxham with a ninety-minute Broads cruise: http://www.bvrw.co.uk/trains/boattrain.asp. Three adults can sit comfortably side by side in the passenger coaches, some of which have electric heating for winter operation. It’s a seriously attractive attraction. This entry was posted in Transports of Delight on February 20, 2014 by Mike Higginbottom. At present, the Mid-Norfolk Railway [http://www.mnr.org.uk] preserves an 11½-mile-long, unremarkable stretch of the former Great Eastern Railway between Wymondham and Dereham. Though there is a physical connection to Network Rail at Wymondham, public services stop short at Wymondham Abbey. As well as providing the usual tourism services of a heritage railway, the enterprising Mid-Norfolk line provides freight services through its connection to the national network, serves military traffic and provides testing facilities for the rail industry and training opportunities for the emergency services. Most of its operations are diesel hauled, and there are regular appearances of guest steam locomotives. Reaching this stage of development has been a considerable struggle [http://en.wikipedia.org/wiki/Mid-Norfolk_Railway] and future plans are ambitious and exciting. The Mid-Norfolk Railway Trust owns a further six miles of track-bed northwards to County School Station (built for and named after a long-gone boarding school operated by Dr Barnardo’s from 1907 to 1953). Linking this section to the existing line provides a springboard for a further lengthy extension to Fakenham. And that’s not all. The proposed Holt, Melton Constable & Fakenham Railway plans to reinstate continuous railway from Holt to Melton Constable, the core of the Midland & Great Northern Joint Railway system, continuing on to the M&GNR main line to Fakenham, where it would ultimately connect with the extended Mid-Norfolk Railway on the former Great Eastern Railway. The completed project, the Norfolk Orbital Railway [http://www.norfolk-orbital-railway.co.uk/index.html], would reintroduce rail transport to north-west Norfolk, and provide an 84-mile continuous loop incorporating the current rail-services between Wymondham, Norwich, Cromer and Sheringham. 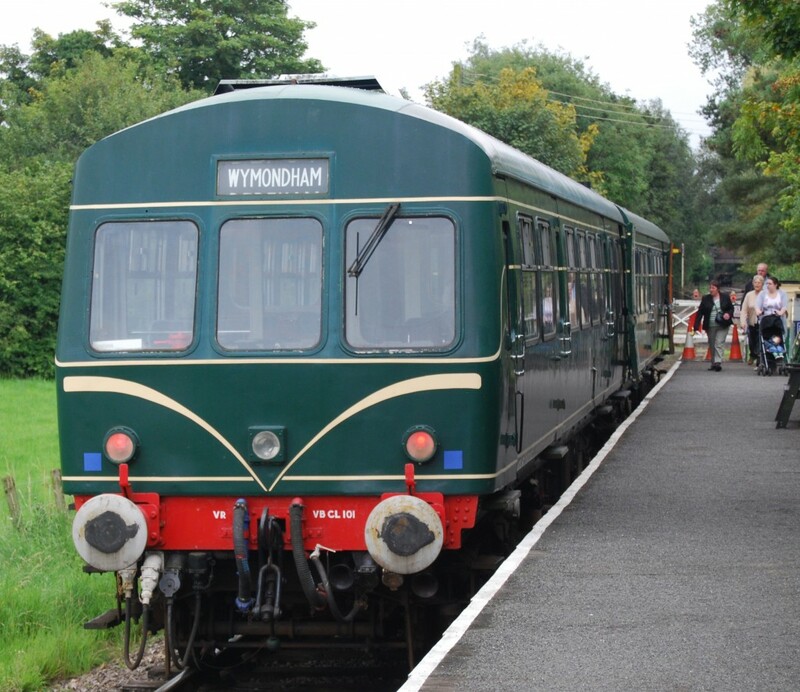 A further project, the Whitwell & Reepham Railway Preservation Society Limited, based at Whitwell & Reepham station on the M&GNR Fakenham-Norwich line, has long-term [http://whitwellstation.com] plans to reinstate seven miles of track and to link with either the North Norfolk Railway or the Mid-Norfolk Railway. This entry was posted in Transports of Delight on February 16, 2014 by Mike Higginbottom. On Riverside Drive overlooking the River Hudson is a great twentieth-century Gothic church of surprising proportions, the Baptist Riverside Church, largely financed by John D Rockefeller Jnr, and opened in 1929 to the designs of Allen, Pelten & Collens. Especially when seen from the river, the huge tower, 392 feet high, dominates the church, which is itself a hundred feet high and 215 feet long. 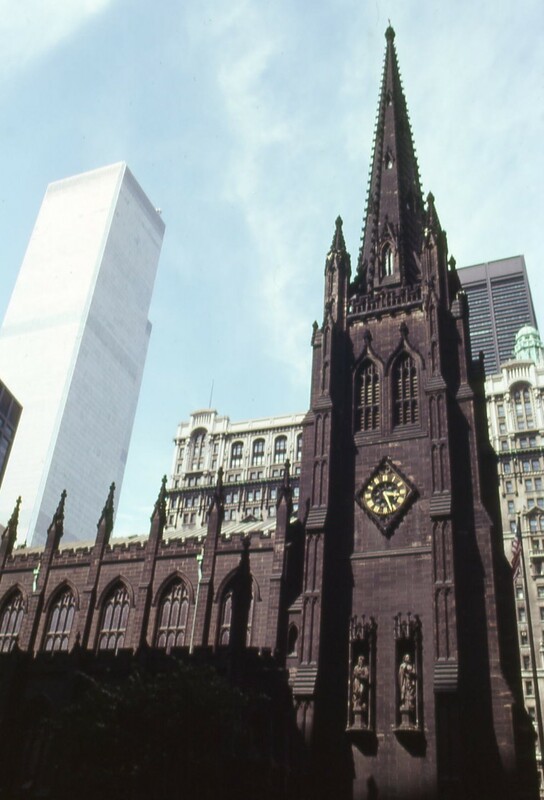 The tower is in fact a 22-storey office building for the church administration, surmounted by a 72-bell carillon which – until 9/11 – visitors could inspect on their way to view the panorama from the top of the tower, from where the skyscrapers of Lower Manhattan dot the horizon. Riverside Church is proud of its stained glass and sculpture. It has two Epsteins, the bronze ‘Madonna and Child’ (1927) and the gilded mould of the cast ‘Christ in Majesty’ at Llandaff Cathedral, Wales. 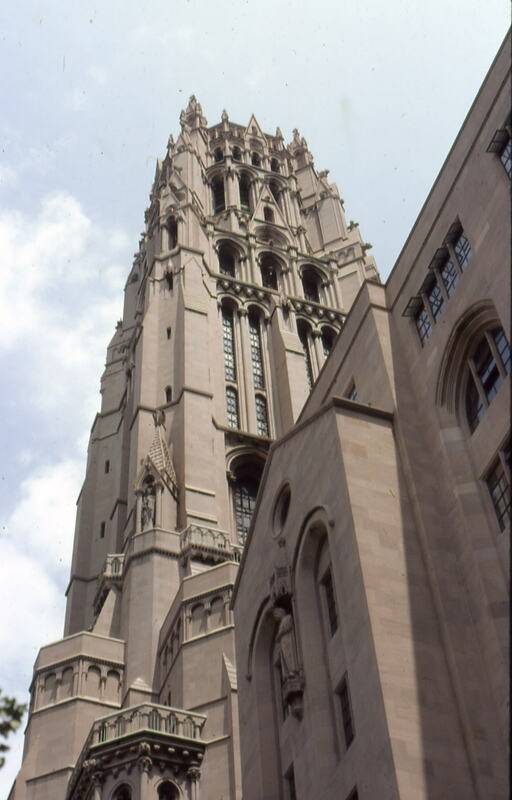 From the outset of its ministry, started by Rev Harry Emerson Fosdick (1878–1969), Riverside Church has been a springboard for all kinds of social intervention, and has provided a pulpit for a dazzling array of speakers, from Martin Luther King to Nelson Mandela, Jesse Jackson to Desmond Tutu, and Fidel Castro to Bill Clinton. This entry was posted in Exploring New York City, Sacred Places, Survivals & Revivals: past views of English architecture on February 11, 2014 by Mike Higginbottom. Perhaps the most famous image of Wall Street is the vista westwards along the canyon of tall twentieth-century buildings to the apparently modest-sized Trinity Church, designed by Richard Upjohn and completed in 1846. This was itself once the tallest building on Manhattan, 281 feet high. The original foundation dates from a royal charter of 1697, and the present building is the third on the site. The great wealth of the trustees arose from Queen Anne’s 1705 grant of the land west of Broadway between Fulton and Christopher Streets, the rentals of which have supported widespread endowments, educational institutions and subsidiary chapels. Upjohn’s church was a significant influence on the architecture of nineteenth-century New York, firstly because it effectively established the Gothic Revival here (though its suspended plaster vault would have offended contemporary English purists such as Pugin), and because it helped to popularise the use of the local brownstone, a material which became synonymous with New York housing in the half-century that followed. This entry was posted in Exploring New York City, Sacred Places, Survivals & Revivals: past views of English architecture, Victorian Architecture on February 7, 2014 by Mike Higginbottom. At the north end of Lime Street, on the opposite side to the Futurist Cinema, is the much more imposing former Forum Cinema, designed for the ABC circuit by William R Glen and Ernest A Shennan and opened in 1931, “one of W R Glen’s finest”, according to the Theatres Trust website: http://www.theatrestrust.org.uk/resources/theatres/show/2102-forum-liverpool. This splendid Portland stone building occupies a corner site corresponding to Lewis’s department store at the other end of Lime Street. Its fine interior, described by some writers as “semi-Atmospheric”, was a celebration of the possibilities of indirect lighting using Holophane reflectors with a sunburst light-feature in the ceiling. On each side of the proscenium are curious relief panels, supposedly Venetian though both include recognisable representations of the Chrysler Building. The architects contrived to squeeze a big auditorium, originally 1,835 seats, into a constricted space 150 feet × 75 feet, by creating a huge balcony seating 750 and placing the projection ports high above the rear circle with a throw of 146 feet. Such a narrow auditorium was less than ideal for wide-screen films, and when the Forum was tripled in 1982 a false ceiling was inserted from the balcony front so that the proportions of the proscenium were lost. It finally closed in January 1998 with a showing of Casablanca at 50p per seat and has remained unused. Although (or perhaps because) it’s listed Grade II, the various proposals for the building have so far come to nothing. 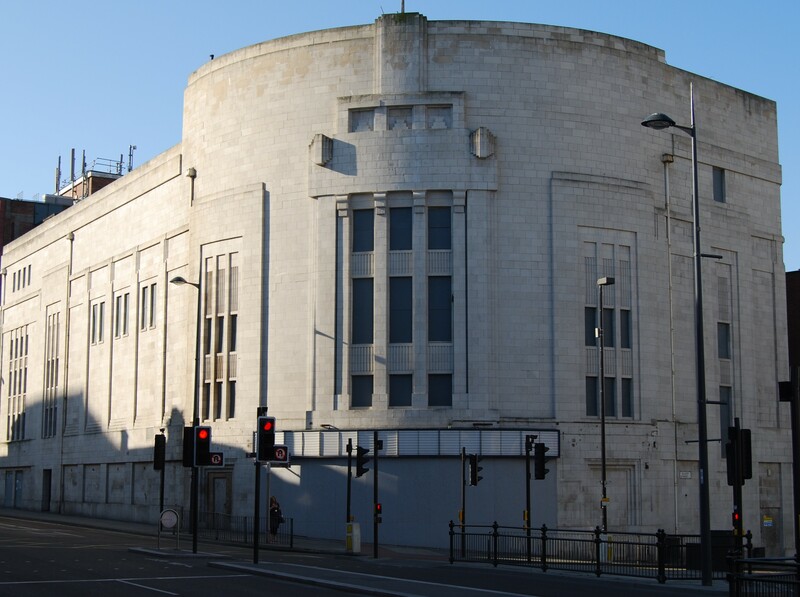 A recent urban explorer report shows that the division between stalls and circle has been removed, recovering the original auditorium space: http://www.derelictplaces.co.uk/main/leisure-sites/32830-abc-cinema-liverpool-march-2016-a.html#.V0O15Y-cGUk. This entry was posted in Fun Palaces, Liverpool's Heritage on February 2, 2014 by Mike Higginbottom.